Log cabin luxury with country club amenities, Bison Turf is the best of both worlds! This premier vacation rental blends the warmth of log cabin charm with an upscale country club location that features views of both the soaring Beartooth Mountains and the Red Lodge Mountain golf course green. Hit the course or the slopes and then relax in your own private hot tub before falling asleep in the spacious master suite. 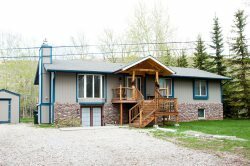 This fully stocked log home features rich western décor, living room with wood burning stove, 2 kitchen areas, open air loft, extended family room, master suite, flat screen TVs, large decks, private hot tub and sleeps up to 10 in cozy comfort. Love the house but don’t need all that space? Ask us about renting the front half of the home for a reduced rate! Great location and very close to downtown would stay again anytime!